Christmas has been totally different here in Sibu. In a previous blog I mentioned several things I missed this year. I will add one more to the list. SNOW! I don't care if it doesn't snow very often at home, but I miss the white stuff and the chill in the air. It just doesn't seem like Christmas without it. It has been a great week, in spite of the fact that it hasn't been cold. There have been plenty of branch and missionary activities. Branch 1 had two Christmas parties. 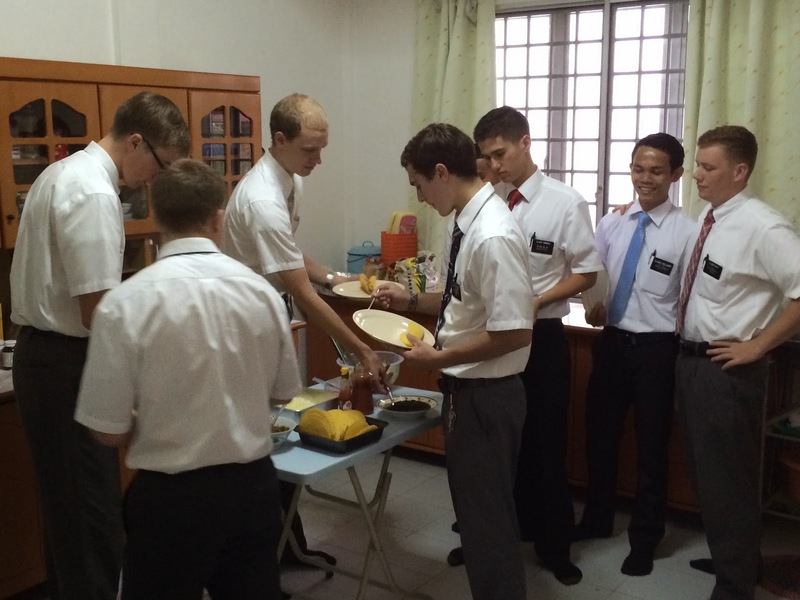 We missed part of the second one due to a Branch 2 party at the home of Brother Merang and family. That was enjoyable. There were several members there who helped cook the chicken outside on the grill along with wild boar cooked inside bamboo poles. I didn't think to take pictures of that. Maybe I can remember next year. 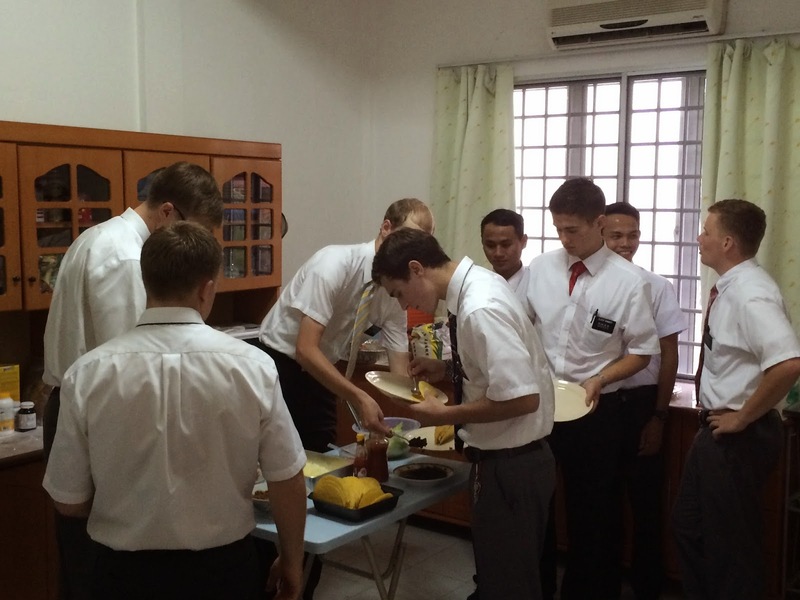 Sister Bodell took a small loaf of banana bread for Brother Merang's wife. She gifted us later with a music box and a homemade Christmas card. I think all Christmas cards here are homemade. I have seen any sold in stores. There was also a Branch 2 party at the church on another night. They also went caroling to members homes and the Branch President was able to visit with his flock. Branch 1 had two parties at the church. There was also a "progressive" dinner on Christmas Day in Rantau Panjang where many of the members live. We started at the home of Brother Steven. His wife had prepared many yummy, spicy dishes. You can see the spread. We sat on the floor and ate. Then we all went to President Gara's home and had more, but not as spicy. We didn't need to sit on the floor there as they have a couple of seats. We all went to two more homes after that and had more of the same. 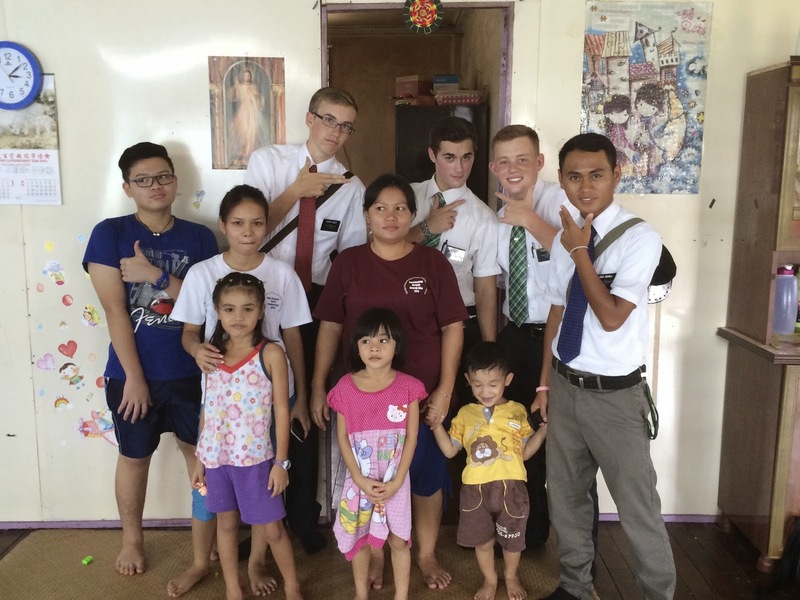 There were two more homes to which we should have gone, but it was getting late, one of the missionaries wasn't feeling well, and we were stuffed. I don't think we could have eaten another bite anyway. We were disappointed that we couldn't go to the other two, but that's the way it is. Home #1 on the "Progressive" Dinner. Each house was like this. We had started Christmas morning by visiting a family from Branch 2. There was a meal served there as well. 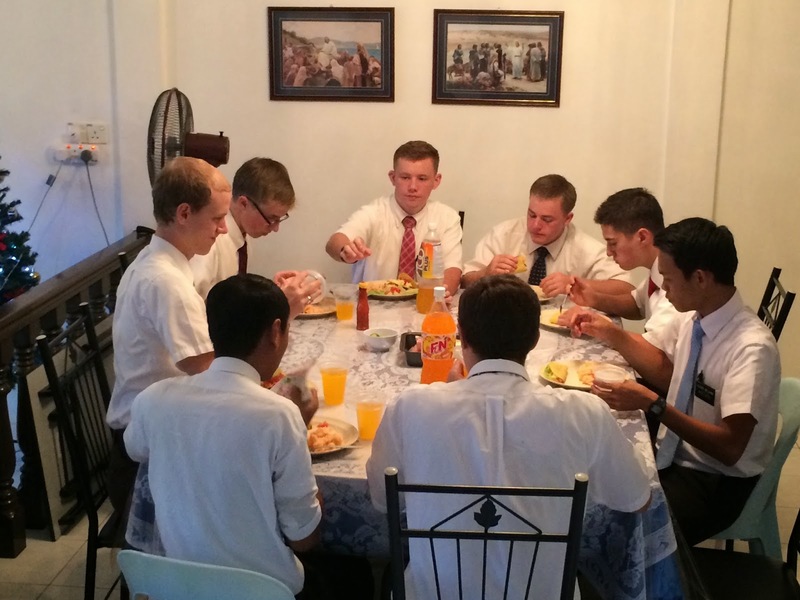 The members always serve us and the missionaries something when we go to their homes, even if they are very poor. 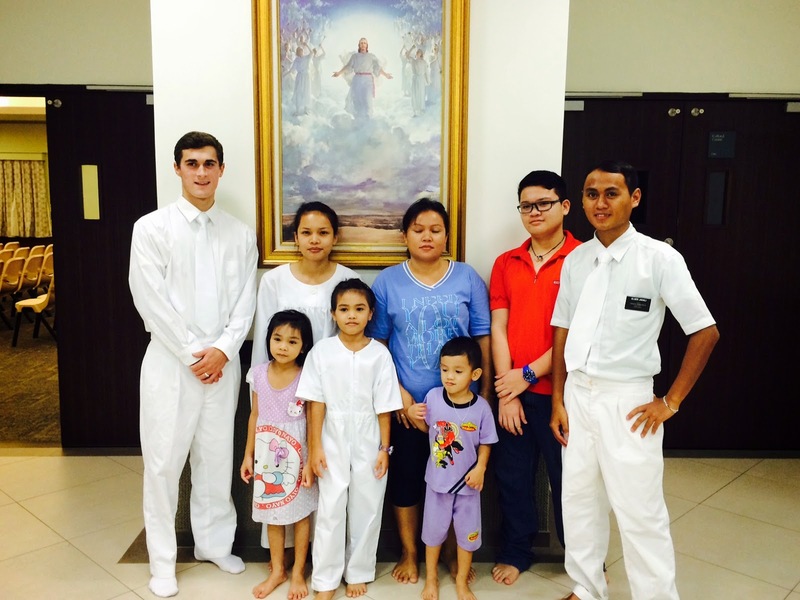 We visited with a family the day after Christmas who was just recently baptized. Two more daughters are being baptized this evening (Saturday). There's is a humble home, but clean. Again we sat on the floor and were served cookies and a drink. Sister Molly and her family. She and her son, Michael were baptized recently. Her two oldest daughters are being baptized tonight. After that we visited another sister and her daughter in their very small, two-room apartment. I was amazed as I knew them fairly well. They always dress well for church, but their humble surroundings made me stop to think about the blessings we have. The mother is a member of the Branch RS presidency. Their outward appearance portrays a contrast of their actual circumstances. It was after this visit that we went out to Rantau Panjang for the "progressive" dinner. Christmas in Sibu itself is a lot different than in Utah. They don't normally give gifts. Houses are not decorated on the outside. There is Christmas music blaring in the stores, but it's raucous. 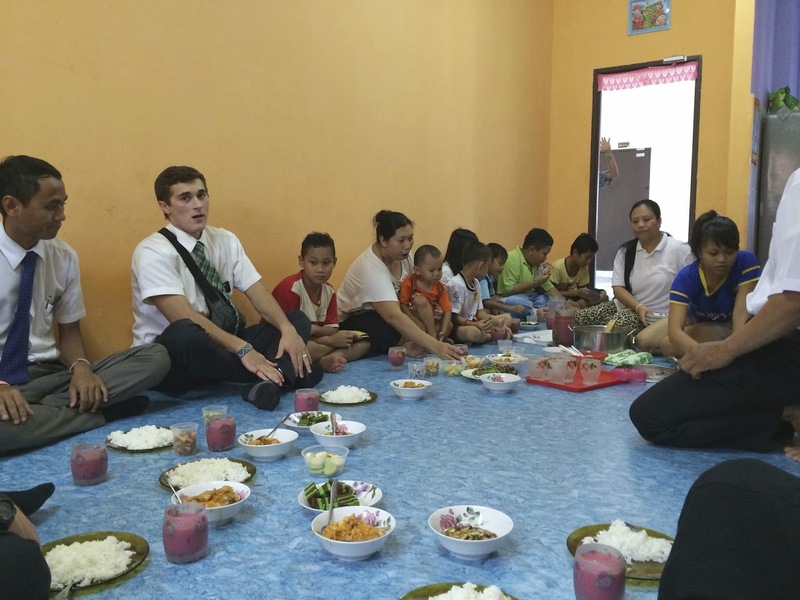 There was no Christmas program in Sacrament meeting, but the Christmas story was told at the parties. There aren't any branch choirs to sing. The branches are too small, but Christmas music is sung in their meetings. There are some Christmas decorations on the stores and inside, but lacking the all-out decorations like in America, but they still have their Christmas sales events. We had several of the Elders over to Skype, FaceTime, or use Google Hangouts to visit with their families. It was fun to hear excited mothers and other family members say hello to their sons. The Elders were also excited to visit with their families as well. What a blessing technology is! Back in my mission days it was still black, dial telephones. Phone time was expensive so calls were short. 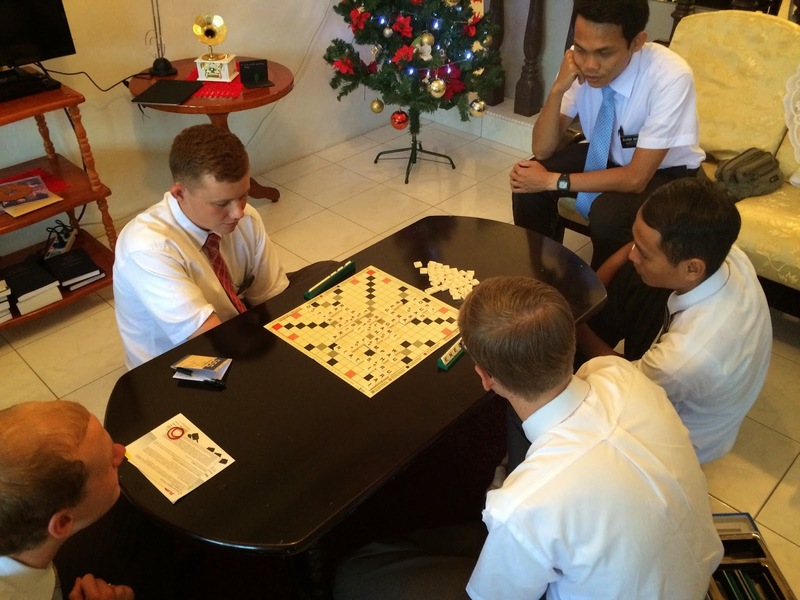 Now the missionaries get an hour to call their families, and it's all free, even from here! 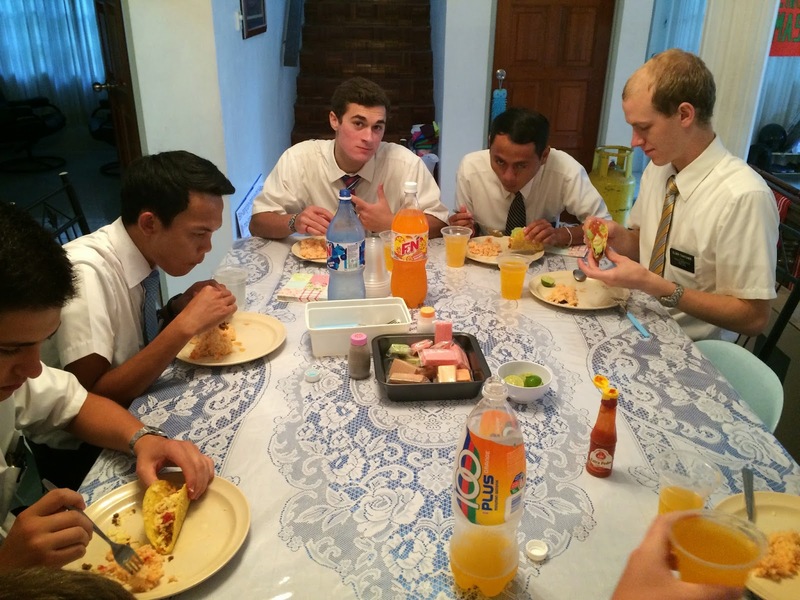 After the Skyping, we invited the Elders to stay for a taco lunch. They loved it! After lunch we had a language study session. We played Sahibba, a Malaysian form of Scrabble. Yes! All the words had be Malay. This moment of silence was brought you by Sister Bodell and her home cooking! This was the Sibu Zone prior to the last transfer. We were able to talk with our kids and grandkids for Christmas as well. We do miss them! It's been a great week though, and two baptisms to top it off this evening. 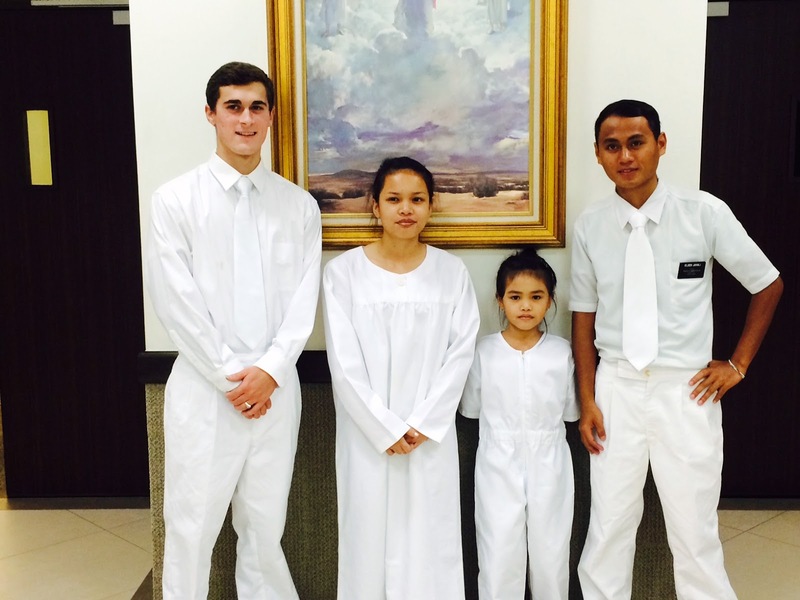 Sister Molly (the mother) and Michael (the older son) were baptized two weeks ago. Michael gave the talk on the Holy Ghost this evening.